Joe Marichalar, right, was named the new head football coach at Donna North. DONNA — After a 45-minute executive session on Tuesday night, the Donna ISD school board reconvened inside the board room at the DISD Staff Development Center with a final decision. Interim superintendent Filomena Leo recommended to the board that the district hire Joe Marichalar to be the next Donna North football coach. The board confirmed Leo’s recommendation. Marichalar received confirmation from Leo by phone after the board meeting was over. Marichalar comes to Donna North after five seasons as the head coach at Edcouch-Elsa, his alma mater. 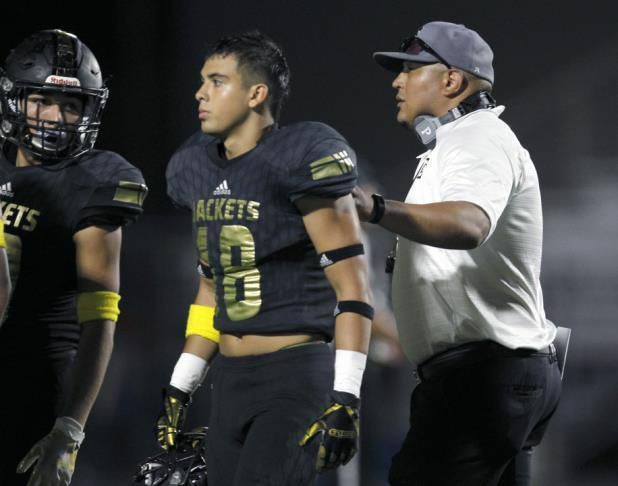 He went 37-21 over that span with an outright district championship in 2013 and four playoff appearances, including third-round playoff appearances in 2015 and 2016. Marichalar was reassigned following a 5-5 season in 2017. Marichalar takes over for Matthew Rokovich, who retired at the end of the 2017 season after two years as Chiefs head coach. Donna ISD’s hire of Marichalar makes him the third different head coach since Donna North began playing varsity football in 2013. The Chiefs’ all-time record is 6-40. Donna North is transitioning into new territory as a young school. The latest enrollment figure of 2,231 students at the school places the Chiefs’ football program into the 6A classification for the first time. “We played Edcouch a couple times when E-E was a 4A, Donna (High) was a 5A school, and it didn’t go Donna’s way,” Ceniceros said. “Sometimes, the guy that’s coaching at a smaller school gets a lot more done with less.